The single-seat F/A-18 Hornet is the nation's first strike-fighter. It was designed for traditional strike applications such as interdiction and close air support without compromising its fighter capabilities. With its excellent fighter and self-defense capabilities, the F/A-18 at the same time increases strike mission survivability and supplements the F-14 Tomcat in fleet air defense. F/A-18 Hornets are currently operating in 37 tactical squadrons from air stations world-wide, and from 10 aircraft carriers. The U.S. Navy's Blue Angels Flight Demonstration Squadron proudly flies them. The Hornet comprises the aviation strike force for seven foreign customers including Canada, Australia, Finland, Kuwait, Malaysia, Spain and Switzerland. Thanks to the US Navy for that intro. 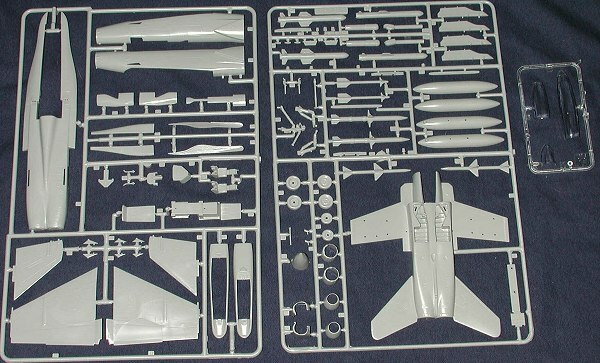 The kit is molded in Italeri's usual medium grey plastic and on two large sprues. The kit has the options of being built either as a C or two seat D model. There are also a large number of weapons provided including Harms, Sparrows, Sidewinders and Harpoons. No bombs are provided, though the two sensor pods and a pair of drop tanks are included. Moldings are fairly well done with crisp, raised detail. There is a touch of flash on some parts and I found quite a few ejection pin marks on the landing gear, gear door interiors, missiles and some other small pieces. Won't be easy to clean some of those, I'm sure. Had this been a new mold kit, I'd bet that there would be no or few ejector pin marks. I also found some of the raised detail on the forward fuselage sides to be spotty, a sure sign that the molds have gone through a lot of cycles. The kit is designed to do either a single or twin seat aircraft, though the instructions make no mention of this option. Probably because of the single decal option provided. A real poser is that the canopy can be displayed open, but one has to cut the framework from the canopy section. A rather odd way of going about it, especially as the hinges won't be an easy removal. I'm sure that 98% of these kits are built with the canopy closed. Not that it isn't a bad option as the cockpit is rather basic. There is raised instrument detail on the panels and side consoles and the kit does include two seats and control sticks. Frankly the seats look a bit on the generic side so perhaps replacements would be in order from the aftermarket folks. I'm equally sure that Eduard does an etched brass set that could only help matters. Instructions are typical of Revell AG in that they are printed on newsprint quality paper, have a ton of warnings (in several languages) and only provide Revell (or is it Humbrol) paint references. You have to mix some of them (like the major airframe colors...sheesh! 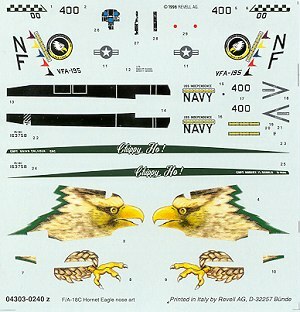 ), but fortunately, on the decal placement and painting guide page, the FS 595 numbers are provided for those. The rest of the instructions are well done and totally pictorial as is the norm for European kits. 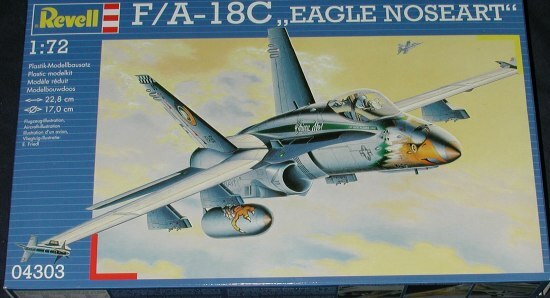 Decals are for the single aircraft pictured on the box art. They are very well printed and probably done by Cartograf. They are a touch thick and nearly matte. It will be interesting to see if the large bird head will actually wrap around the nose without any real problems. If it works it will make for a very impressive model. If you would like your product reviewed fairly and fairly quickly by a site that has nearly 200,000 visitors a month, please contact me or see other details in the Note to Contributors.